Well, actually if you believe the press at the moment macarons are actually the new cupcakes. I am no baker, more of a basic cook with ok-ish results. I was however completely sucked in by the overly tempting cover of last month’s cover of Delicious magazine. The recipe makes 40, so as the instructions suggested I split the mixture in half to make some in pink and some in yellow. It was a bit of a faff to get the mixture into the piping bag (well the one I have anyway) and I needed to leave a bit more space between each round to allow for them to spread a little without the edges touching, but pre insertion into the Aga I was pleased with how things were going…. By the time the pink ones were in the oven and I had washed out the piping bag I think all of the air had gone out of the yellow mixture. 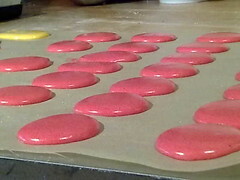 It had gone too runny and there was no way on earth they were going to stay in lovely rounds like the pink ones did. I also definitely needed a lot more yellow food colouring in order to get a good colour once they had been through the oven. Sadly in both cases (but more so the yellow) the rounds ended up completely stuck to the baking paper. They (the pink ones) taste good and are lovely and gooey in the middle, but so far I’ve not managed to get a single one off the paper without it breaking! I lost my patience and threw the lot in the bin! Sad really as it was a waste of time and ingredients and I was planning to give them as Easter gifts. Looks like chocolate it is! I think I may stick to cupcake making in the future or shop for some lovely ones when next in London! maybe you put in too much food colouring? Just a thought. Ask English Mum she might be able to suggest something. I love those macaroons – Laudree are the best but also you can buy Maison Blanc ones at Waitrose now. Hi! Came here via Liz at Living with Kids. Just looked at the recipe on the Delicious website and noted that there are lots of comments about the recipe not working. I’d try a different recipe – I think it was that, rather than you, that was at fault! I also read those comments, sadly after I failed miserably! I did buy some colouring pastes, but wasn’t sure how to use them and there were no instructions on the little jars. I probably should have just given them a go?